This project surprised me in a number of ways, not least of which was the response. It has become the most visited item around this site and I thought it would be fun to show how it was made, with the hopes that it sparks some makiness in you. 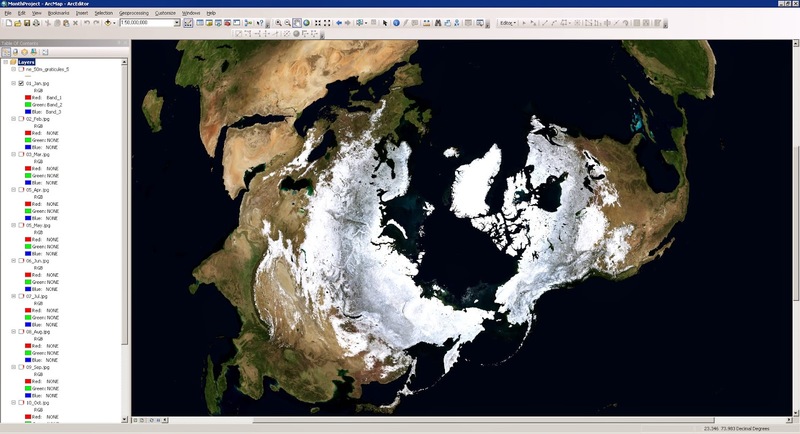 One day last summer I had the opportunity to show Joshua Stevens, a cartographer I really admire, how I make severe basemaps using NASA imagery. 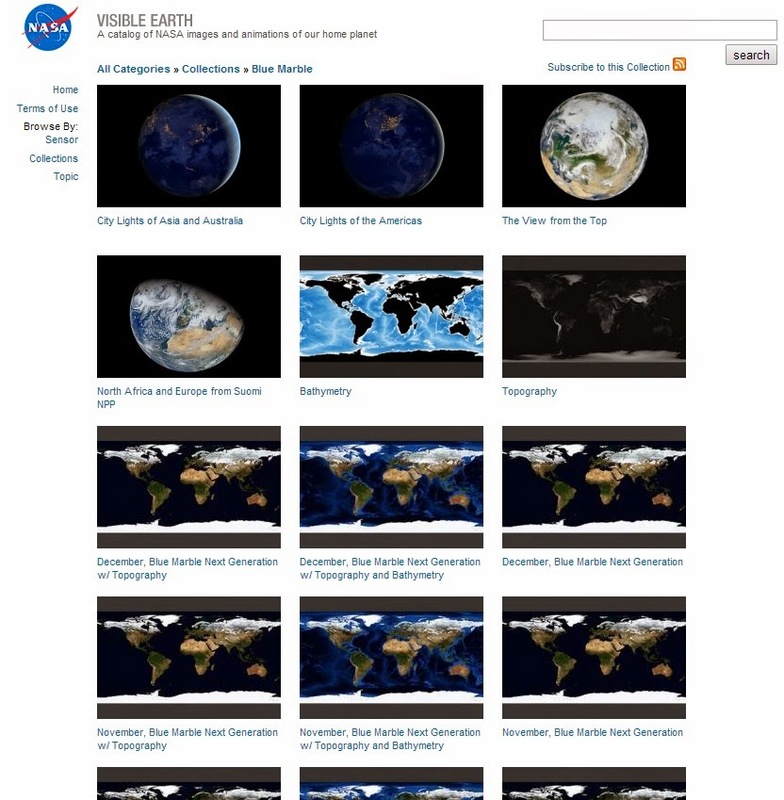 When I pulled up the NASA Visible Earth page (a great resource for beautiful per-month satellite imagery mosaics of earth) and scrolled down, I noticed the thumbnails dance like a zoetrope of polar ice creeping up and down. Mental bookmark, this could be a fun project and it shouldn't take long. As I found out later, I wasn't the first to think of this, not surprisingly. But I was the first to do it this way. The serendipitous zoetrope effect of dancing thumbnails as I scroll down. So I downloaded all twelve months and georectified them so that they were spatially aware and I could play with warping them into all sorts of geographic projections. I ultimately chose an Azimuthal projection, centered over the North Pole, because it was sphere-like but I also benefited from not loosing all of the coverage of mid-latitudes at the horizon (which I would have if I'd used a truer spherey projection). And the fact that the projection made Earth look a little trippier than if you were just seeing it as a globe was a plus. 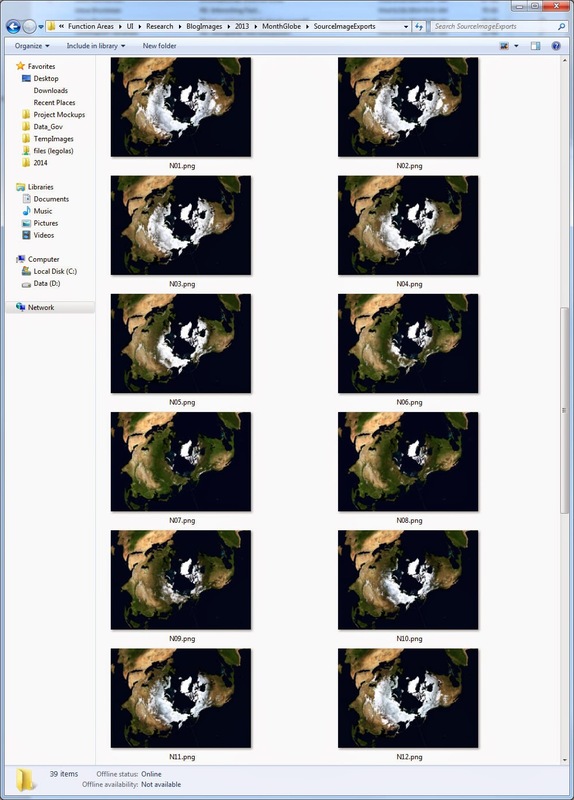 I used ArcMap to re-project and export the images. 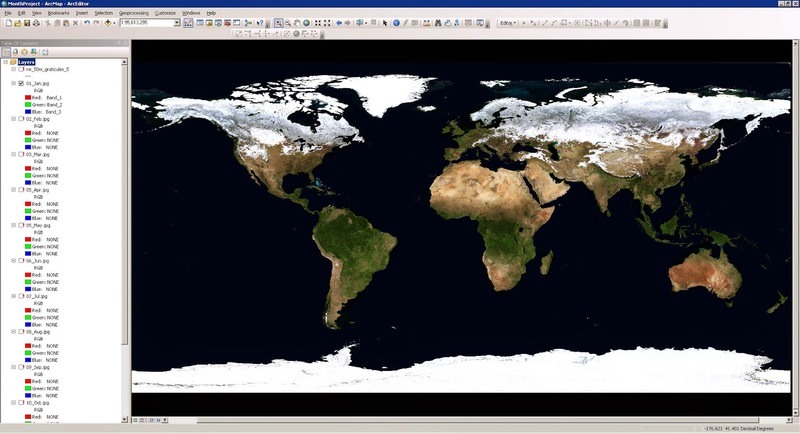 ArcMap has a lot of export options, including the ability to define a transparency color and define any crazy resolution you want. Plate carrée is a convenient starting projection, but shouldn't be used for a finished map (unless you track satellite telemetry). Good old Polar Azimuthal. Definitely not a true globe perspective but I don't lose the interesting bits in the lower latitudes that would have otherwise wrapped off into the horizon. 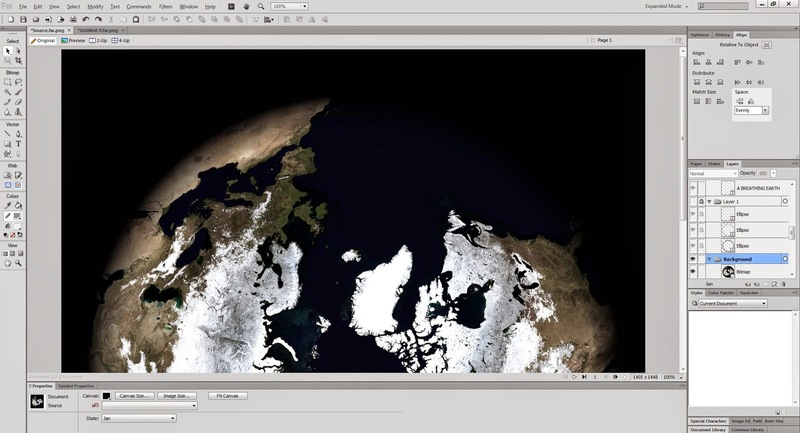 One projected polar-projected image, per month, out of the GIS and into the image processor. Ohmygosh ohmygosh ohmygosh! When I scroll down in the file explorer I got a flipbook sense for the ice movement. This just might work! I put all twelve satellite images into Fireworks and aligned them on top of each other; one per layer. I get teased, but I like Fireworks. I'm used to it and it seems to do anything I need. But there is nothing here that you couldn't do in Photoshop or Gimp. Once I added all the images I added a layer over-top filled with an elliptical fade overlay to vignette out the edges of the maps and set up the round look of the finished earth. Stacking, aligning, and cropping the raw exported images. Then I slightly desaturated the imagery -as is my way. Desaturating imagery creates a more epic feel and teases out tonal variability that might otherwise be overwhelmed by hue. I learned about this by watching the making-of DVD extras for The Fellowship of the Ring, where a post-processing artist said that in order to make the Shire feel greener they actually reduced the green band. I thought that was wonderful. Desaturating ratchets up an oddly paired sense of intimacy and distance, used to tremendous effect in Saving Private Ryan. Pulling down the color saturation of the imagery has emotional and practical benefits. Next I drew in some atmospheric haze around the horizon. It's just a stack of circles of lighter to darker colors that I added increasing rates of Gaussian blur to. If you've never tried this you should, it is really fun. Atmospheric perspective was one of the Renaissance painters greatest gifts. It creates the sense that this disk has depth -all of the sudden it becomes a thing, rather than a snapshot. Which is, like, the whole point. Ohhh forced atmospheric perspective. You had me at hello. Then I added sources and a title -my least favorite part of the process is a title, but an important one. I also included a small tic sequence to indicate the progression through the year, which I'll describe in the animation section below. This one is showing December, so the first tic is highlighted. Title and sources. A short but descriptive name greases the skids of social share-ability. Because animated GIFs (I use the hard G pronunciation, even though it's wrong, because that's how it's sounded in my mind for 15 years and Jiff is peanut butter) are hard-stop frames the effect is naturally really rigid. So between each month, I hacked a transition frame which is just the next image in line at 50% opacity. At the right pace, the twitchiness of an animated GIF is reduced. Humans are really bad at change detection. I found that 7/100ths of a second resulted in the most natural and organic pace for the annual animation -after trying a kajillion other frame rates. My criteria was that I find a balance where I could look at the whole earth and its pulse would seem smooth but unhurried. I also wanted to be able to look at any one spot and track it through the whole animation without it feeling like I was waiting too long to ride one full cycle. Adding intermediate between-month frames to make the animation smoother. When I generated the initial animation and opened it up the first time, I was taken aback. I was hoping for a jee whiz sort of image but even though I was well aware of the process and the tricks, it evoked all sorts of personal senses of time and family and perspective on the pace of my life. I went into somewhat embarrassing, but sincere, detail about that here, and I was honored (and relieved) to see that it had an effect on others, too. In any case, if you've read this far, I hope you are inspired to give something like this a shot and pour your own sort of craziness into it. It was definitely fun for me to look back on how this was made and reminisce on the process and I hope selfishly that reviewing this will help me get back to making again. It's been a while! This is really great. Thanks for sharing your process as well as your finished product. Is there a way to slow this down, say to what a normal breath would take? Amazing and beautiful work, kudos for you from Argentina! Asombroso y hermoso trabajo. Felicitaciones desde Argentina!